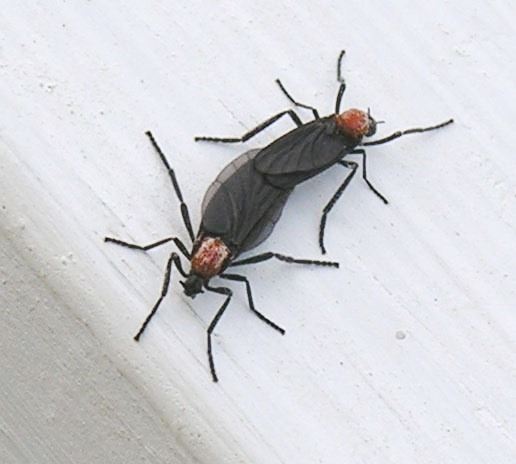 Localized lovebug flights can number in the hundreds of thousands. The slow, drifting movement of the insects is almost reminiscent of snow fall except that the flies also rise in the air. Two major flights occur each year, first in late spring, then again in late summer. 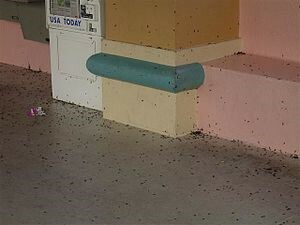 In south Florida, a third (but smaller) flight can occur in December. The spring flight occurs during late April and May, and in the summer during late August and September. Flights extend over periods of four to five weeks. Mating takes place almost immediately after emergence of the females. Adult females live only three to four days, while males live a little longer. They have to stick to each other at all times. This species’ reputation as a public nuisance is due not to any bite or sting (it is incapable of either), but to its slightly acidic body chemistry. Because airborne lovebugs can exist in enormous numbers near highways, they die in large numbers on automobile windshields, hoods, and radiator grills when the vehicles travel at high speeds. If left for more than an hour or two, the remains become extremely difficult to remove. Their body chemistry has a nearly neutral 6.5 pH but may become acidic at 4.25 pH if left on the car for a day. In the past, the acidity of the dead adult body, especially the female’s egg masses, often resulted in pits and etches in automotive paint and chrome if not quickly removed. However, advances in automotive paints and protective coatings have reduced this threat significantly. Now the greatest concern is excessive clogging of vehicle radiator air passages with the bodies of the adults, with the reduction of the cooling effect on engines, and the obstruction of windshields when the remains of the adults and egg masses are smeared on the glass. Lovebug adults are attracted to light-colored surfaces, especially if they are freshly painted, but adults congregate almost anywhere apparently reacting to the effects of sunlight on automobile fumes, asphalt, and other products affected by environmental factors still not completely understood.